A meteor crashes into a quiet lake in the remote countryside and awakens a centuries-old beast, who tears through a nearby town and its inhabitants, who must fight for their lives and stop this Queen Crab before she can hatch an army of babies. I found "Queen Crab" on Amazon marketplace, although it was titled "Claws" on the DVD release. And being a sucker for creature features, and the low price of the movie, made me pick it up and give it a chance. I didn't know anything about the movie prior to buying it in terms of story or cast ensemble. I managed to sit through about 30 minutes or so of this movie before I gave up out of sheer and utter complete boredom. Very little, and I do mean that literally, happened throughout the course of this movie. The storyline, at least from what I managed to sit through, was about a scientist's formula that could rapidly increase growth, that quickly got out of control. "Queen Crab" (aka "Claws") had some questionable CGI effects right from the very beginning, and the CGI animated crab wasn't looking particularly convincing in most scenes. This just meant that the movie took on a comical demeanor. The characters in the movie were sort of one-dimensional, and no one was in particularly memorable. I am sure that the people on the cast list were doing good jobs with their given roles, but they just had very little to work with in terms of script and storyline from writer and director Brett Piper. Actually I was ready to get up and turn off the DVD way before the approximate 30 minutes I endured, and that was when an explosion destroyed the Laboratory. It was so inconsistent, because the parents were down in the basement, yet the explosion happened in the tower, and that still managed to kill the two people in the basement. It was just so stupid. And the fact that the explosion and CGI effects here were not even anywhere near being believable. I have no plans to return to finish watching "Queen Crab", as it just didn't have anything to offer in terms of entertainment value. My main reason for seeing 'Queen Crab' was it being part of my "seeing low budget films out of curiosity" quest. Expectations were conflicted, with the premise being somewhat intriguing if silly and with the potential to be a guilty pleasure. With it not looking particularly good and the low rating, part of me was nervous. Watching 'Queen Crab' taking all that into account, with conflicted expectations and taking it for what it is, the film certainly could have been far worse and there are definitely worse films out there, of its genre, kind of film and in general. Is it an irredeemably bad film? No. Is it a good film? Not even close. 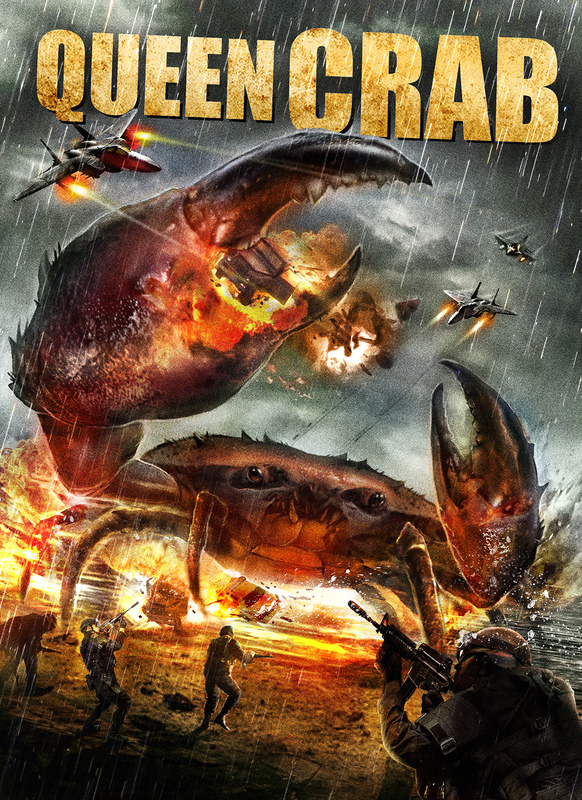 Did understand what 'Queen Crab' was going for, that it seemed to pay homage to 50s creature films and it was clear for it to not take itself seriously, but felt that it didn't execute either very well. And this is coming from someone who gave the film a chance with no intention to dislike it with prejudice, and saw the whole thing. The effects are not great at all with some awkward movements and cheapness, not blending well often with the environment, but they could have been far worse. While the intention to not take itself too seriously is to be applauded, 'Queen Crab' too often gets on the wrong side of silly absurdity. Story-wise, it is ridiculous with a lot of draggy pacing, as a result of paper thin, often unevenful and over-stretched story-telling, and clumsy and far from tense or suspenseful action. The acting is a bad mix of overdone and bland, no real standouts while the photography is relatively drab, the ending is far-fetched and the dialogue is cheesy and ham-fisted. For all those faults, 'Queen Crab' is not a complete mess. The titular creature has a little menace and is not too goofy. The sound isn't too intrusive or too much of a drone. 'Queen Crab' has the odd fun moment, it doesn't confuse and at least it was clear what tone and approach the film was aiming to go for, that cannot be said for a lot of low-budget viewings seen recently.